BOGOTA, WILLEMSTAD - Prime Minister Eugene Rhuggenaath talked with partners of the Dutch Kingdom in the region during his short visit to Colombia for the inauguration of President Duque. During the bilateral meeting with the President of Costa Rica, Mr Carlos Alvarado, in the presence of the Vice President and also Foreign Minister, Ms Epsy Cambell Barr, talks were held about relations between Costa Rica and the Kingdom and especially Curaçao. 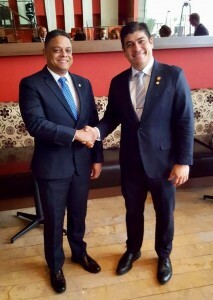 It has been agreed that Costa Rica and Curaçao will cooperate by sharing knowledge and experience about the poverty reduction project in Costa Rica, Agenda 2030 and the 'sustainable development goals'. The countries will also look at structural possibilities to strengthen economic relations. The heads of state also discussed the accreditation of universities in Costa Rica and soon a committee of Curaçao will travel to the Central American country to visit the universities. Finally, they discussed the further cooperation under the San José Convention against organized crime in the wider Caribbean region.